Nearly 2.7 million children have an incarcerated parent, yet few resources exist to help the youngest of these children. To meet this need, Sesame Street created its “Little Children, Big Challenges: Incarceration” Initiative, which includes multimedia, bilingual (English/Spanish) materials to help young children (ages 3-8) of incarcerated parents, their families and caregivers, and the range of professionals who help families. Sesame Street: Incarceration app for adults to use on tablets and phones, available on Google Play, the App Store and the Amazon Appstore for Android on Kindle Fire. 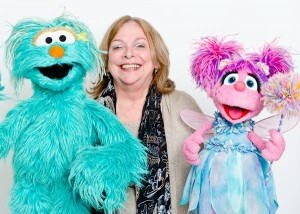 To identify the needs of children of incarcerated parents and their families, Sesame Workshop worked closely with an expert advisory panel, which included Rutgers University Camden’s own Ann Adalist-Estrin, Director of the National Resource Center on Children and Families of the Incarcerated. Sesame Workshop looked to the expertise of advisors like Ann to help guide both the development and distribution of Little Children, Big Challenges: Incarceration resources into correctional facilities and organizations that specialize in early childhood education, mental health and counseling, parenting programs, foster care, and that have missions specific to helping families cope with the incarceration of a loved one. Since the initiative launched in June of 2013, over 300,000 multimedia resource kits have been distributed to partners across the country, in every state. With the help of advisors, Sesame Workshop piloted a deeper implementation of these resources to strong networks in several key states: Arkansas, California, Florida, Illinois, Minnesota, New York, Oklahoma, Texas, Virginia, and Wisconsin. Digital materials are available to help families and service providers who don’t have access to multimedia kits. Little Children, Big Challenges: Incarceration videos have been viewed over 300,000 times on YouTube. The initiative continues to be one of the most popular topics on SesameStreet.org, with an average of 7,000 visits of sesamestreet.org/incarceration per month. Finally, the Sesame Street: Incarceration app has provided resources on the go for parents and service providers, who have accessed the app over 35,000 times. To evaluate the impact of these resources on young children of incarcerated parents and their families, Sesame Workshop has commissioned researchers at the Research Lab for Resilience and Early Childhood Development in the Department of Pediatrics, Rutgers Robert Wood Johnson Medical School. Findings are expected in Fall of 2014. Page last updated by The National Resource Center on Children and Families of the Incarcerated at 3:55 pm August 22, 2017 . This page was printed from http://nrccfi.camden.rutgers.edu/2014/05/19/sesame-street/ at 8:30 PM Monday, April 22, 2019.